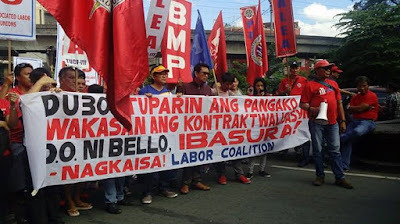 Worker protest undertaken by NAGKAISA labor coalition during the holiday season derailed the passage of DOLE Department Order 168 spoiling premature employer celebrations that they would no longer have to regularize millions of contractuals. Under DO 168, “endo” and other contractuals would be regularized under the manpower supply agencies rather than in companies where they work. The suppose new arrangement follows the "win-win" solution proposed by DTI Secretary Ramon Lopez. But in a dialogue with convenors of the NAGKAISA labor coalition last Thursday, DOLE senior officials led by Secretary Silvestre Bello announced to the group that no new Department Order was issued before the end of the year. Said Order should have been issued as planned last December 28, according to Labor Undersecretary Dominador Say in a separate media interview Thursday. NAGKAISA had launched mass actions and made appeals to President Duterte to reject the draft department orders circulated last month which apparently would allow an army of non-regular, contractor-deployed "seasonal" and "project" workers to supplant the despised "endo" system of contractualization. President Duterte had made a campaign commitment to end contractualization within few weeks upon assumption to office. He reiterated this commitment during a year-ender interview with media. NAGKAISA warned that the supposed DO would perpetuate the contractualization policy that the President promised would be stopped. Bello said he was willing to listen to the workers comments in crafting a fresh DO. The Secretary directed all his Undersecretaries to come out with separate drafts which will be consolidated by the DOLE into a new version on January 13. Said version will then be referred to the National Tripartite Industrial Peace Council (NTIPC) for consultations and will be issued as DO 1, series of 2017 when approved. However, despite the suspended status of the new rules, NAGKAISA said workers face the same question on whether endo will be finally ended or the promise to ending endo is dead-ended by strong capitalist lobby or held hostage by economic managers. During the dialogue NAGKAISA formally requested Sec. Bello to set up an audience with President Duterte where workers can air their appeal for the passage of an Executive Order that will serve as a stop-gap measure to proscribe contractualization until a new law amending the Labor Code is passed. NAGKAISA further requested that the President certify as an urgent Administration measure House Bill No. 4444 (Rep. Raymond Mendoza, TUCP Partylist). HB 4444 seeks to prohibit all forms of short term employment contracts and the criminalization of such offense.